It was 1996, and it was the summer between my freshman and sophomore year of college. I was working at a restaurant in Boston called ‘MIracle of Science” (it was just outside of MIT). I hated my job after a few weeks and wanted to be outside, and decided to look for a new job. At the time, looking for a new job meant scouring the paper, not the internet. There was an ad in the Boston Globe for a lacrosse counselor at a co-ed camp in New Hampshire. I was a lacrosse player at the time and thought the job sounded perfect. I called the number, but the position had been filled. I kept that little scrap of paper from the Boston Globe and called the number again in the winter. I set up an interview and landed myself a job for summer 1997. Little did I know that at the exact same time I was searching the papers for a summer job, the staffing director at the same camp was working on a new concept called CampStaff. The company would create a place on-line for people to find jobs; a brand new idea. Even less did I know that I would meet this staffing director at camp that following summer, and marry him 5 years later (see photo for reference of youth). Even less than that did I know that 20 years later I would be the one answering your CampStaff inquiries and talking to you about how to get a job at camp. Lucky for all of us, we don’t have to scour the papers anymore for a job. 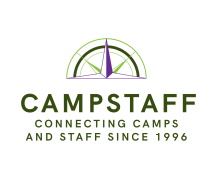 Lucky for us that CampStaff has a new website to make your job search easy. And lucky for all of us, camp holds a special place in our hearts.